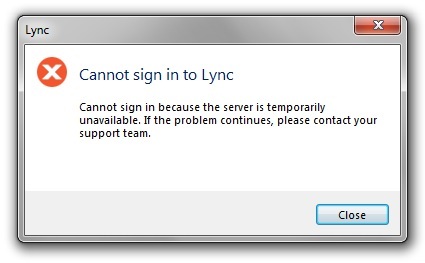 Possible reason for this error is if you have not created the DNS records required for Lync Online. which the yourdomain.com should be replaced with the domain you have added and verified with Office 365. Adding above DNS entries will resolve the issue with Lync client. Some registerars such as 1and1 don't let you create SRV and TXT type records in the DNS. If that is the case, you will need to configure each and every Lync client in your organization to manualy point to Lync Online servers on Office 365. In the Advanced Connection Settings, change the coniguration setting to manual and change both Internal and External server names to sip.online.lync.com:443. confirm changes and restart Lync. thanks Amin - very useful information for us. We use 1and1 and it is a bit of a limitation. i cannot sign in to lync, i get error message lync cannot connect because the server is temporary unvailable. I did every you advised, still does not works. We resolved this by adding the CNAME and _sip SRV entries on the local Active Directory DNS as well. im having the same problem how do i do the CNAME and _sip SRV entries on the local Active Directory DNS as well. Thanks it is working as per your instruction, I have added dir with sip in the command line see the 2nd line. The same problem! And since Friday, 26 August 2011!!!! What adds up to the advantage of searching criminal records at a one-stop-shop are the websites giving information free of charge.